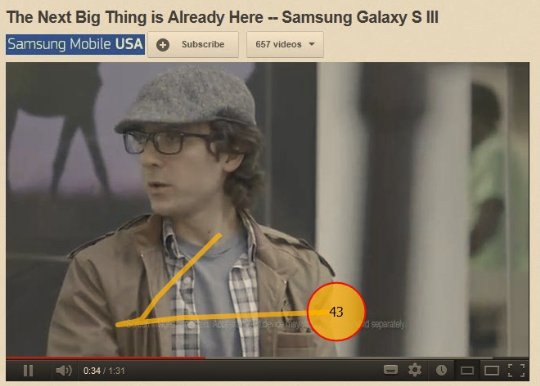 By now, hundreds of thousands of people have seen the Samsung Galaxy ad The Next Big Thing is Already Here – Samsung Galaxy S III. 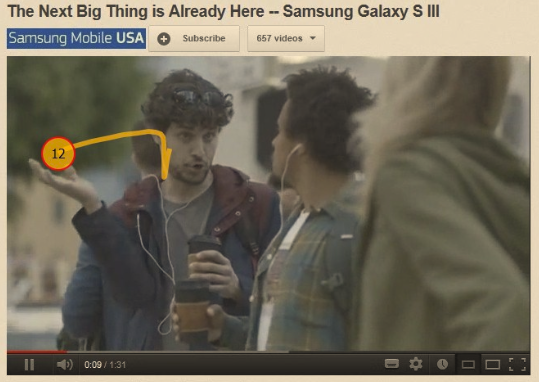 The ad takes a jab at iPhone people who wait in line for something that the Galaxy S3 already has. 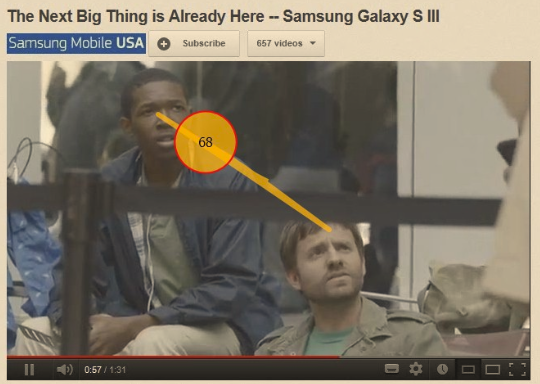 I have run this ad through our Eye Tracking software to see if there is anything interesting that pops out and here is how we actually saw the advert. 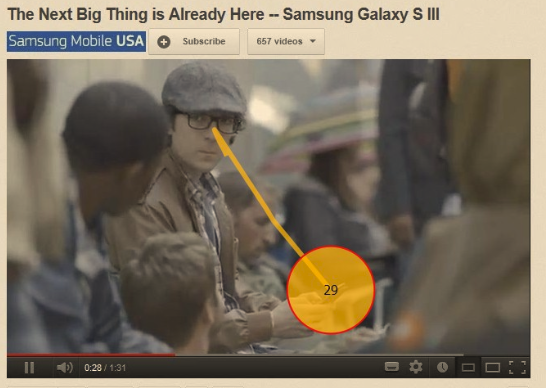 Quick explanation: The yellow circle and lines are the pupils of the eye and where they dart around the screen whilst watching the advert. A circle is depicted at any point where the eye stops. 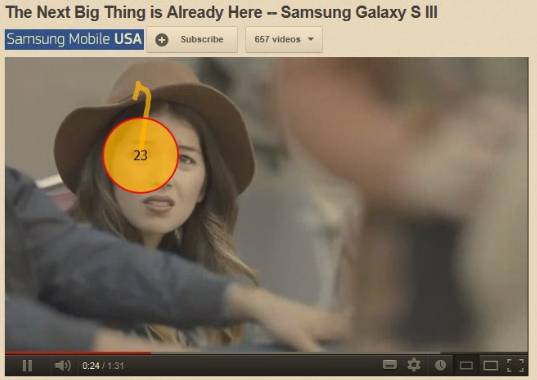 The larger the circle the more time spent on that particular location. At the point where they talk about the “earphone jack at the bottom”, notice how we focus on the person and then hand movement. Where there is no dialogue we follow gestures and our eyes are attracted to those gestures. This point is where this lady is informed that “they make really cool adaptors” and we focus intently on her expression as we take in her look of confusion. 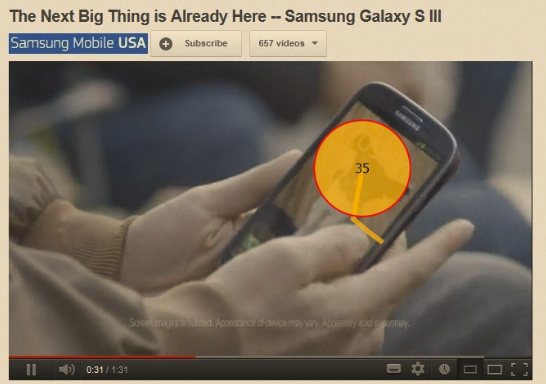 Obviously we focus on the Galaxy S3 when it is in main view of the screen, but also note how we look for the phone even when its not the main attraction. When the parents show up for their place in the line, it catches us off-guard and we focus intently on the parents as our eyes dash from Dad to Mom and back to Dad again in disbelief. Same thing happen with the people looking on at the parents. Our eyes dart back and forth. We note that our eyes focus on people and specifically people’s faces. We take in their emotions and when we are caught off-guard our reaction is to try make sense of the situation by taking more info in. How does knowing this help business ? Once you able to to understand how people experience your adverts and where they focus their attention, you are able to customise and tailor the advert more to your audience. The same applies for website and printed adverts. Experience the visual information through the eyes of the customer and you can better tailor your solution to fit and retain their attention. 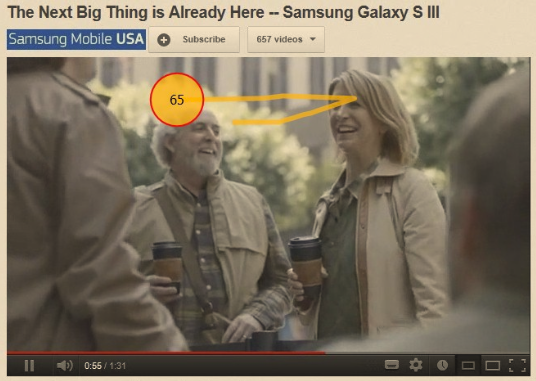 Check out our research on Eye Tracking and website design for more insights.